A bipartisan bill that would give residence visas to foreigners who spend at least $500,000 to buy houses in the U.S. The provision would create visas that are separate from current programs so as to not displace anyone waiting for other visas. There would be no cap on the home-buyer visa program. Holy Cow! U.S. Visa to buy a house there and no, U.S. Visa is not the name of a welcome drink that the realtor promises to serve, it is indeed the U.S. residence Visa – the thing that allows you to stay in the US and go about your business. The objective behind the bill seems rather nice. 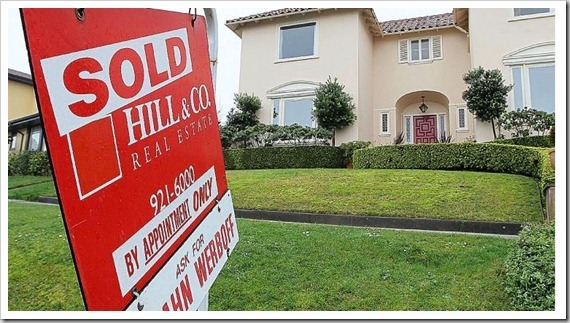 The U.S. real estate market is still in shambles and there is no demand but a huge supply. So, the senators are proposing that any foreigner willing to shell out $500,00 (or $250,000 in a house and the rest in decorations etc.) gets rewarded with a U.S. Visa. Yes, you can buy the American Dream for 2.5 crore rupees…you don’t need to have anything else! Well, the senators sure seem to be cognizant of the idea that no one has the money in the US so might as well make the deal sweeter for foreigners who might have spare $500,000 (About 2.5 crore rupees) lying around. This plan also highlights the growing importance of foreigners in the US. Chinese and Canadians are already buying in the US real estate market taking advantage of the low prices and minuscule competition. I am wondering if there were any Marwaris or Gujjus (no offence meant, I am one myself) involved in the drafting of this bill. Even if they weren’t, I am sure they will be front runners to buy real estate in the US should the bill get passed. I also wonder if some another senator will may be want to give Groupon a call and launch a daily deal for a house. What are your thoughts on the seemingly crazy idea of receiving a US visa on buying a house? However, $500,000 does sound like a sweet deal given that one might find it difficult to buy a house in Mumbai itself in the same price! India ranks 132 on ‘Doing Business Index’, gains 7 places! Other than cities, most of the houses are built with wood. The whole area is planned for housing, using the design of the house, they design the parts of the houses to be made, make the parts on industrial scale in mass production units, bring them to site, assemble to make a house. (From an Indian point of view, all of it looks so artificial). Even the piles on which the house stands is wooden blocks !!. Naturally as the wooden houses have less life span due to rain, air weathering and pest damage, the so called housing sector gets repeat orders after certain years (even after taking care of pests by pumping in pest control chemicals underground). When I see this from an environmetalists point of view, the whole housing industry is unholy. 1) First they strip the area of vegitation (mostly forest area around cities) which is forest cutting down. 2) They cut down trees to build parts for housing. 3) They pump in pest control chemicals in ground polluting ground water year after year. 4) When due to floods or typhoons the paper houses (sorry wooden houses) fall down or even damaged, they pull down the whole house and rebuild it. Now how the circle is a vicious one. As the parts of the houses need to be made in mass production units, the industry needs lots of orders. The cartel of this industry push govts for allocation of more and more houses for survival. Then finally when the banks run dry of money, they influence media to create hype around the difficulties of the sector. Then govt jumps in for rescue and announces discounts, give money to banks and announce schemes like above. How to solve housing problems? Just because factories ar ethere does not mean they have to run all year round to keep producing housing units. When there is no demand, stop the industry (factories and construciton industry) from working. Its natural. Why build houses when they ar enot required? The same problem is in auto sector also. During recession, the first sectors to be effected are luxury sectors. (Some people say vehicles in US ar enot luxury but neccessity. But tell me changing a car every year even if you have no food to eat is neccessary?). If they stop auto industry in times of no demand, people will be used to maintaining their existing cars (like we Indians do) for long time. Also it saves nation from producing unneccessary produce and divert the money into other areas like health (in times of recession people have no money for health care), food (concessional prices by absorbing the losses like Indian govt on ration food and petrol). Give money to schools. I think this is a ridiculous idea, the reason being there was an artificial demand created in real estate and that is one sector that the US needs the least investment in. Investment in real estate, will only drive up the prices of housing, something our NRI’s have been doing in India for long. What the US needs is investment in sectors like manufacturing which are hurting. I doubt if this bill will ever get passed, though it is an interesting idea but will create no value. Interesting thought! I agree that there was an artificial demand created (CDR et all project US real estate as a goldmine) but the bank foreclosures and the lack of demand has come out strongly post 2008. So, this does mean that there is real estate available and probably no takers for it. This does suggest that there is real demand, isnt it. Actually the idea by itself is not crazy at all. The housing sector creates a lot of jobs and if demand for housing is propped up it will solve Obama’s immediate problem of rising unemployment. When new houses are built it creates construction jobs, banking income, provides business to local stores – grocery, plumbers, restaurants .. everyone sees an uptick in business. I think the idea is to give the economy as a whole a boost and hope that it kickstarts a new spending by the people who gain. Whether this bill will actually become a law, and whether foreign investors will jump into it is a different matter. I might be mistaken here, but I think there are a lot of units already built that are currently lying with banks. The scheme is intended to take them off from the banks and inject some capital. Also the surround services would get an inflow of money. When I visited the west coast in 2009 there were more than 40-50% new houses that had been foreclosed by banks and these houses have not found buyers still. I don’t think this will get past congress but if it did will just postpone the problem for the US not solve it. Quite right. Unloading the foreclosures on foreign buyers. However being freed from the deadweight of foreclosures will loosen bank’s purse strings to lend more .. what they are hoping is to kickstart housing in general. It’s a moot point anyways. Why anyone would put down 500K in cash for a house and a non-work, non-immigrant visa is beyond me .. when you can legitimately buy a greencard for the same $$ investment. Is it 1 visa for 1 home or a family of four can go along? This plan also highlights the growing importance of foreigners in the US. The objective behind the bill seems rather nice. I am sure the senators will get the bill through by arguing that when business visa is already existing, by giving res visa for 500G they are not really altering anything. I recon, there is some thing called Business visa which gives you green card and later citizenship if you invest USD.250,000 in US business and employ US citizens. I am sure the senators will get the bill through by arguing that when business visa is already existing, by giving res visa for 500G they are not really altering anything. It will boost real estate sector. US sincerely does not care who is getting visa. They allowed the same for polish, russian gangsters, romanian smugglers, italian mafia, panamian drug traffickers. It does not matter if Indians and Chinese are given res visa for investing in faltering real estate sector. In fact they are doing a favor for their nation. this is one of the most funniest thing i saw about US visas, although it is hard to believe. .